This image from NASA's Chandra X-ray Observatory captures an unusual supernova called SN 2014C in the spiral galaxy NGC 7331. A perplexing "chameleon supernova" is challenging the way astronomers study massive star explosions. When some stars reach the end of their lives, they explode in a bright stellar event called a supernova, releasing material created in the heart of the star out into the universe. There are different types of supernova explosions, and astronomers generally classify these powerful outbursts based on the presence of hydrogen. But in a recent study published in The Astrophysical Journal, astronomers examine a supernova called SN 2014C that released a lot of material (including mostly hydrogen and heavier elements) unusually late in its life but before it exploded. The so-called chameleon supernova — perhaps named because its appearance makes it look like something other than itself — resides in a spiral galaxy about 36 million to 46 million light-years from Earth. The spiral galaxy NGC 7331 (center) is seen in this visible light image from the Sloan Digital Sky Survey. The galaxy is home to the strange supernova SN 2014C (inset). "This 'chameleon supernova' may represent a new mechanism of how massive stars deliver elements created in their cores to the rest of the universe," Raffaella Margutti, lead author of the study and an assistant professor of physics and astronomy at Northwestern University, said in the statement. "Expelling this material late in life is likely a way that stars give elements, which they produce during their lifetimes, back to their environment." The material released into the universe following massive star explosions serves as the building blocks of Earth and other planets in our solar system. However, astronomers question why SN 2014C would throw off so much hydrogen before exploding. Using NASA's NuSTAR (Nuclear Spectroscopic Telescope Array) satellite, astronomers found that "SN 2014C had transformed itself from a Type I to a Type II supernova after its core collapsed," NASA officials said in the statement. Although hydrogen was not detected in initial observations, shock waves coming from the star explosion hit an outer shell of mostly hydrogen material, suggesting the star released the material decades to centuries before it exploded. 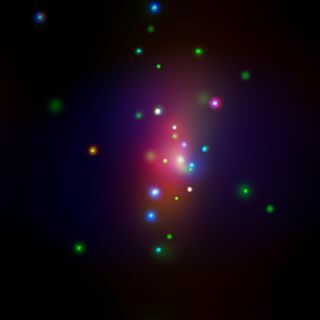 What's more, astronomers also found that the "supernova brightened in X-rays after the initial explosion, demonstrating that there must be a shell of material, previously ejected by the star, that the shock waves had hit," according to observations from NASA's Chandra and Swift observatories. One hypothesis for SN 2014C's unusual behavior is that the star was part of a binary system and did not die alone — its possible the gravitational pull of a nearby star influenced SN 2014C's evolution, according to the statement. Roughly seventy percent of massive stars have companions, NASA officials said. "The notion that a star could expel such a huge amount of matter in a short interval is completely new," Fiona Harrison, NuSTAR principal investigator and professor of physics and astronomy at Caltech, said in the NASA statement. "It is challenging our fundamental ideas about how massive stars evolve, and eventually explode, distributing the chemical elements necessary for life."